After defeating the Wicked Witch of the West, the Wizard of Oz contracts Johnny the Plaid Arborist to remove the Fighting Trees from the banks of the Munchkin River. 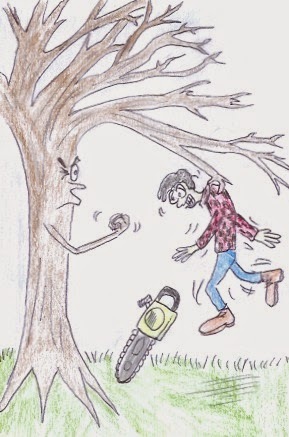 Now Johnny is a seasoned arborist, but since last year’s run in with some trees in Tennessee while under contract by an Ashley J. “Ash” Williams, he’s a wee bit skittish around sentient plant life. This was his first gig since being on leave after that job for 13 months. Let’s just hope this experience doesn’t put him off of his next gig at Mushnik’s Flower Shop in New York’s slums. - this Lunchroom Larf is brought to you by "nerdy references".